Candyce Estave speaks about activism as a busy mom in this video from the 2015 Autism One Conference. She also shares the letter she wrote to the school board i response to the school’s misleading signage that said children could not attend school unless they are vaccinated. This letter got immediate results. Stay up-to-date on state and federal changes in vaccine laws. Vaccine Rights Lawyer Alan Phillips speaks about Vaccine Rights. What they are, where they are going, and what you can do about it. Learn about them! DO investigate any and all organizations you may choose to donate to through Charity Navigator or a similar charity review website. What most people don’t realize is that many “charities” barely contribute to the cause they are supporting. For example, Autism Spectrum Disorder Foundation only received a score of 23 out of 100. It says 73% of funds are for education but we don’t know what kind. It may be a reputable charity… or not. Autism Speaks changed its stance on vaccines (Age of Autism likes to report on its misdoings here, here, and here) after the organization got in bed with big pharma and began funding pharmaceutical research, not prevention or helping families. It receives a rating of 73 but only 2 out of 5 stars. And, nearly all cancer societies including Susan G. Komen Foundation, provide almost ZERO for prevention and education and the bulk of their profits go to… well… again, not prevention but treatments and pharmaceuticals. So be smart with your money. Unfortunately not all great organizations are listed on this Charity Navigator. 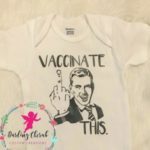 The National Vaccine Information Center (NVIC ) is not listed. 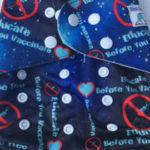 I know from experience NVIC is a reputable organization, so I’ve set my AMAZON SMILE account to the National Vaccine Information Center (NVIC). All eligible purchases I make on amazon provides a small donation to NVIC. While it’s only half a percent, it is something. (Note: I get 4% of every eligible purchase if you use my links… and I will donate my profits to organizations such as Learn the Risk and NVIC). 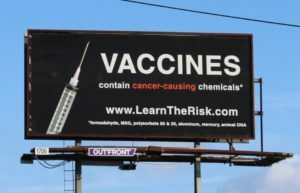 Learn the Risk, a nonprofit headed by Whistleblower and Vaccine Rights Activist Brandy Vaughan (featured in Vaxxed), has a billboard campaign. Learn The Risk can also arrange billboards in your local neighborhood. You can donate through GoFundMe, or skipping the middle man (who gets 3-6%), directly through their website. Donate here, or take action. It may only take you five minutes… or an hour. This is something you can do however /whenever you choose. If you wish to send personal letters directly to each member of the Oversight Committee, responsible for investigating the CDC Cover-Up, there is a list of names and addresses here. Claire, a representative from the National Vaccine Information Center, has suggested using the words “personally want to make you aware” and “informed” about… fill in the blank such as “how vaccines cause autism” or “my child’s vaccine reaction.” Your letters do not need to be legislative and lawyer-like, they want to hear from the people who will be voting for them – you, their constituents. One handwritten letter is worth more than 10 typed letters or 10,000 signatures. Pictures are helpful – if you have a vaccine injured child, put a face to the story. Awareness is important, remember that legislators don’t know the real face of vaccine injury, some don’t know it even exists. Levi Quackenboss – Are You Going To Sit There or Do Something? – this article discusses what to ask, what to say, and who to send your letters to. If you have a vaccine injured child, sharing your story is important. Some people don’t even know that vaccine injuries can happen. Mail vaccine injury stories to the following address. You can mail them individually, several in one envelope, or as a compiled notebook of stories you have gathered from others. They must be handwritten.